The 2017 CIDD Student Conference took place at Rosenheim University of Applied Sciences, just south of Munich, Germany on May 22 through 25. Located in Bavaria within a unique landscape of mountains, forests and lakes, Rosenheim is an attractive place to study in one of Germany’s most beautiful regions. 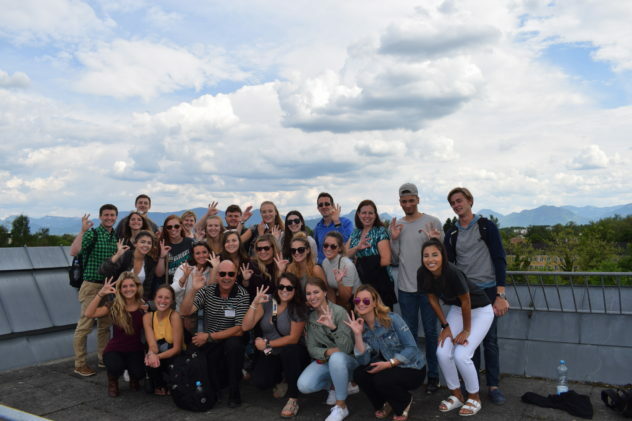 This year the three day conference was attended by 20 students from Coastal Carolina University in the U.S. and over a dozen students from various other CIDD institutions in Europe. The American students attended the conference as part of their Business Studies in Europe trip, which also included visits to two other CIDD institutions – ESCE in Paris and University of Economics, Prague. During the conference, students focused on the influence of culture on international business. Participants learned about the dimensions of national culture, human rights in a global context, as well as key tasks for global managers. They attended workshops by professors from Coastal Carolina University and Rosenheim, visited BMW’s headquarters in Munich and had a lot fun together. The CIDD Student Conference is open to all students from CIDD institutions. Next year, the conference will take place at Augsburg University of Applied Sciences, also a CIDD member institution, just north of Munich, Germany. The 2018 conference will take place on May 16 through 19 and will include workshops in English, company visits and fun activities. The conference is open to all students from CIDD member institutions and is generously subsidized by the CIDD. For more information about this mind-opening conference please contact Professor Yoav Wachsman from Coastal Carolina University at yoav@coastal.edu.